Hill Cottage is an unusual and quirky cottage set in an elevated position on High Barrass, which gives the property one of the best sea and harbour views in the village. Hill Cottage also benefits from a private enclosed patio area for exclusive use by guests. The property was completely refurbished during 2017 to create this stunning base in the heart of Old Staithes. 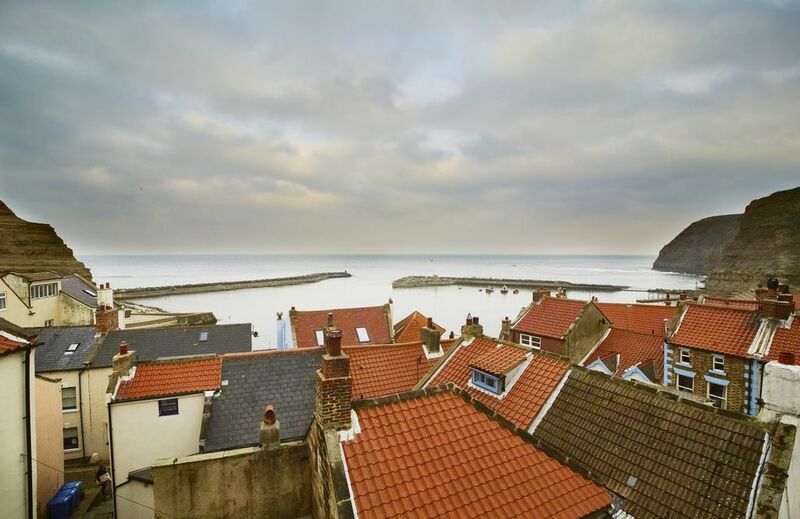 The cottage is bright and sunny and benefits from sea views on all floors with one of the in Staithes from the dual aspect lounge on the second floor. The heating is a mixture of underfloor and thermostatically controlled heaters and pressurised hot water. There is a log burner on the ground floor. Free Wi-Fi access. First floor king sized bedroom and second floor shower room. Please note that the internal staircases are steep and may not be suitable for people with mobility issues. Hill Cottage is only a short walk to the harbour, local pubs and village amenities. Guests will need to approach the cottage on foot and short term parking is available in the High Street for unloading. The Staithes Bank Top car park is a 5-10 minute walk from the cottage and we provide one parking permit when charges apply March to October inclusive. Underfloor heating on ground floor; thermostatic heaters all other floors. Log burner on ground floor. Initial supply of logs and kindling provided October to April. We spent Christmas at Hill Cottage and although it took some effort to carry all our belongings from the quay up the steps to the cottage, it was well worth it. It is beautifully renovated and decorated inside with all mod cons. The shower in particular is the best we’ve ever had in a rental property. The views from the top floor lounge over the harbour and out to sea are spectacular. Lovely wee house, great views from the top floor. Warm & cosy. Excellent position. Best view I've seen of beautiful Staithes. Wood burner. Cosy kitchen. Comfy bed. Top room was a climb but worth it. The panoramic view was breathtaking. Drinking my morning coffee with the windows open, listening to the waves...bliss. a little bit of heaven. We had a superb stay in Hill Cottage in September. The cottage has been refurbished to a very high standard and was very warm and cosy. The views from the lounge on the top floor are amazing and well worth the climb. Just a short stroll to two very good pubs for food and drink. Good walking area and access to The Cleveland Way. We fell in love with Staithes and Hill Cottage and hope to return.